Background and Objectives: Childhood autism is severe and a serious disorder. A study was conducted by Spandan holistic institute of applied Homoeopathy, Mumbai, with the objective of demonstrating the usefulness of homeopathic management in autism. Materials and Methods: Sixty autistic children of both sexes, ≤12 years were selected for this study. 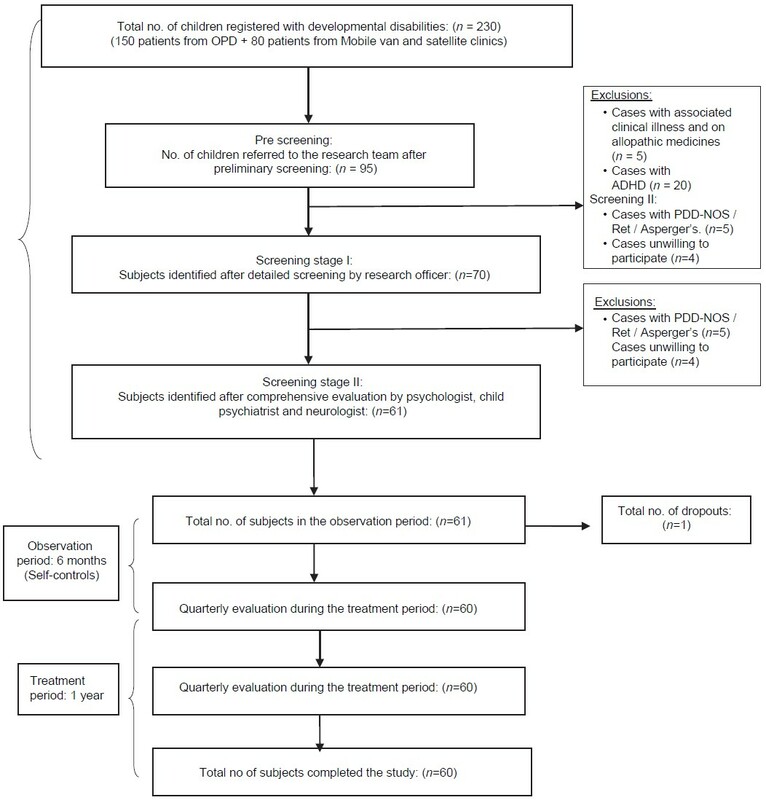 It was nonrandomized, self-controlled, pre and post-intervention study, wherein the initial 6 months of observation period was used as the control period and the same patients were thereafter treated for 1 year and compared with post-intervention findings. Results: The study demonstrated significant improvement of autistic features with mean change in ATEC score (ATEC 1 -pre-treatment with ATEC 5 -post-treatment) was 15.12 and ATEC mean percent change was 19.03. Statistically significant changes in ATEC scores were observed in all the quarters analyzed through repeated measures ANOVA, with F-value 135.952, P = 0.0001. An impact was observed on all core autistic features, which included communication, 12.61%, socialization, 17%, sensory awareness, 18.82%, and health and behavior, 29% (P = 0.0001). Significant improvement was observed in behavior by Autistic Hyperactivity Scale, AHS 1 36 to AHS 5 14.30 with F-value 210.599 (P = 0.0001). Outcome assessment was carried out using MANOVA, which showed statistically significant changes in post-treatment scores, P < 0.005. 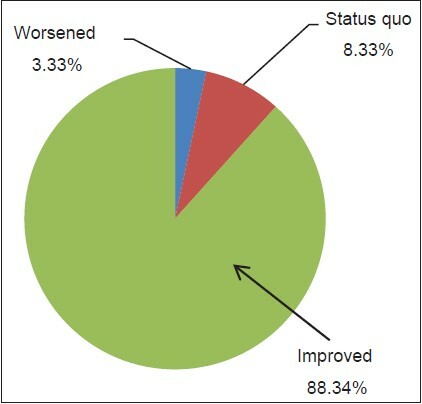 Total 88.34% cases showed improvement, 8.33% showed status quo, and 3.33% cases worsened. Nine out of 60 cases showed a reversal of CARS putting them into non-autistic zone, P = 0.0001. A sharp decrease (34%) in ATEC scores, in the first quarter implied positive effect of homoeopathic medicines, prescribed, as per the homoeopathic principles. Conclusion: The study has demonstrated usefulness of homoeopathic treatment in management of neuropsychological dysfunction in childhood autism disorder, which is reflected in significant reduction of hyperactivity, behavioral dysfunction, sensory impairment as well as communication difficulty. This was demonstrated well in psychosocial adaptation of autistic children. A review of homoeopathic literature identifies clinical experience of physicians in treatment of developmental and behavioral problems such as hyperactivity, impulsivity and delayed milestones. A pilot study provides details about the treatment of seven autistic children with the remedies; Arnica montana, Carcinosin, Stramonium, Natrum muriaticum, Thebaicum and Arsenic album in 200CH along with compound of organo-therapeutics in 6CH potency. Partial analysis of data of seven children out of 30 showed the positive interference of homoeopathic treatment in the cognitive, motor and behavioral performance in autistic patients. These results also suggest that the longer the use of the medication, the more remarkable the improvement in PEP-R (Psychoeducational Profile - Revised) scores. All patients received indicated homoeopathic medications in which Stramonium, Tarentula hispanica, Calcarea carbonica, Natrum muriaticum and Carcinosinum came more often. (The study was presented at a seminar organized by Asian Homoeopathic League in August 2003 at New Delhi, India). This study demonstrated modifications in the behavior of autistic children as well as improvement in sensory impairment thus reducing autistic features. The findings were encouraging to undertake a systematic study. A specific study was undertaken with following objectives. To demonstrate the role of homoeopathic medicines in managing behavioral dysfunctions like hyperactivity, impulsiveness etc., in autism. Administration of the homoeopathic medicines selected on the basis of similarity as elaborated in the Organon of Medicine in appropriate potency and repetition can reduce intensity of autistic features as reflected in significant reduction in the scores measured by study scales. From October 2006 to September 2009, the institute conducted a study of 60 cases of autism. The proposal was submitted to the institutional ethics committee along with comprehensive safety measures. Their approval was received and the committee was updated from time to time during the study. This study was a non-randomized, self-controlled, pre and post-intervention study wherein six months was a self-control period and one year was the treatment period. Children were initially kept on observation for six months without homoeopathic treatment and their scores were recorded. This was followed by intervention with an observation period of one year and at the end of one year, the children were evaluated. The initial six months of observation was used as the control period (self-controlled) and the same patients were treated and compared with the one-year treatment period post-intervention. They did not receive any other pharmacological treatment during the entire period of study. The cases were enrolled from general OPD of M.B. Barvalia Foundation's Spandan Holistic Institute of Applied Homoeopathy and from the institute's mobile clinic. Regular awareness and screening camp were conducted in the community to screen and spot the cases. A series of workshops were held for parents to educate them. The seminars were conducted for teachers of mainstream school of urban areas to sensitize them about role of homoeopathy in autism. Similar seminars were held for teachers from Anganwadis and Balwadis conducted by Central Government in the urban slum areas of M and N wards of BMC (Greater Mumbai Municipal Corporation). Potential cases identified from the above sources were screened by the attending physicians for prominent symptoms of autism. Voluntary informed written consent was taken from their parents/guardians prior to their enrollment into the study, i.e. before the observation period. Children diagnosed as suffering from childhood autism as per DSM-IV (Diagnostic and Statistical Manual). Children undertaking pharmacological treatment or any recent history of such treatment to treat autism within 30 days of participation into the study. A total of 60 children fulfilling above criteria were selected for the study. 10% change in ATEC score was considered as clinically significant. 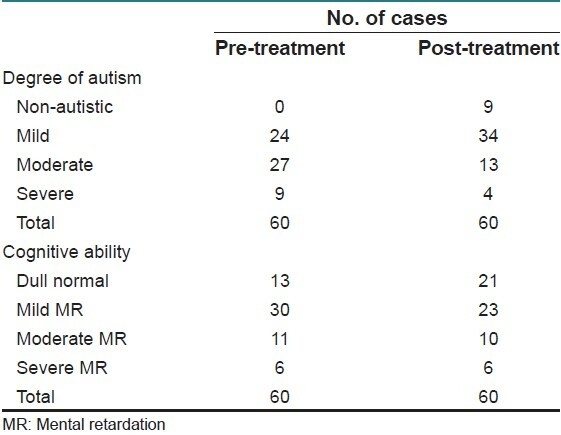 Autism research institute has provided ATEC range from mild to severe with percentile and corresponding ATEC percentage change in scale and subscale. When we study this range, we get some idea about changes in score range 10% change from previous level before intervention has been seen and clinically verified as significant. The diagnosis of childhood autism disorder was made conjointly by homoeopathic physicians (PMB, PO), clinical psychologist, neurologist and psychiatrist. Diagnostic parameters were essentially DSM-IV; an autistic child presents with varying degree of cognitive ability. This was assessed by SQ (Social Quotient) through Vineland Social Maturity Scale. Children were given homoeopathic medicine based on the totality of symptoms. All patients were given medicine in centesimal scale based on their individual susceptibility. Treatment response is evaluated through change in areas such as communication skills, socialization, cognitive and sensory awareness and general behavior. These were measured through ATEC  and CARS  where lower scores show improvement while higher scores signify deterioration/regression of skills. ATEC score was taken six months prior to intervention (ATECprev). Just before intervention, ATEC (Autism Treatment Evaluation Checklist score) was repeated. ATEC score was evaluated every three months during the entire period of study, which provided five readings during one year of intervention (ATEC 1 to ATEC 5 ). CARS was evaluated at the beginning and at the end of intervention. The AHS (Autistic Hyperactivity Scale) was evaluated at every three months during the entire period of study, which provided five readings during one year of intervention. The SQ was evaluated at the beginning and at the end of intervention. A detailed homoeopathic case was taken on a specially designed case record for autism and each case was processed through standardized protocol (Case analysis, Evaluation, Totality formation, Repertorization, Drug differentiation and arriving at Similimum). Each case was examined by a neurologist and child psychiatrist who evaluated the response to intervention. The scales were applied by a clinical psychologist. The children who were from special school and OPD were receiving occupational therapy while those children who were identified through camps were either not receiving any therapy or were receiving therapy irregularly. This mode of adjuvant therapeutic inputs received by the children regularly or irregularly, during self-control phase of six months was not disturbed during intervention phase. Safety measures described during the treatment period was also followed during the observation period. A quantitative study was carried out with respect to change in various scores. But, in addition to this, a qualitative observation was also made regarding changes in child's behavior, social interaction, activities, interests and academic performance. The following scores were utilized for analysis: ATEC (with its various components like communication, socialization, cognitive, sensory awareness, and health and behavior), CARS, AHS and SQ. In addition to the above, impact of intervention on autistic features in relation to different variables like degree of autism, cognitive level, time dimension etc., were also studied. ATEC score was primarily taken for outcome assessment. Subsequently CARS and other parameters were also analyzed for outcome assessment. Treatment outcome assessment was accordingly classified as Mild, Moderate and Marked Improvement. Comprehensive analysis of ATEC scores taken at quarterly intervals was carried out at 95% confidence interval using Repeated measures ANOVA. 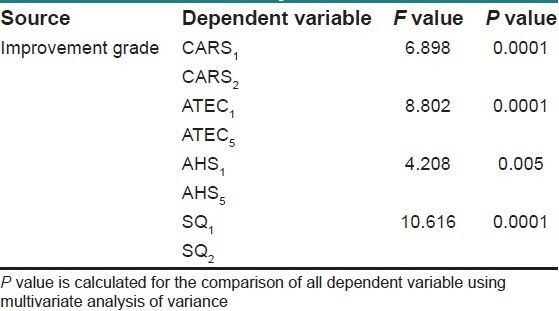 To check whether the difference is statistically significant after treatment between independent variable (Improvement grades - worsening, Status Quo, Mild Improvement, Moderate improvement, and Marked Improvement) and among all the dependent variables CARS, ATEC, AHS, and SQ, a multivariate analysis of variance (MANOVA) was performed using SPSS software ver. 20. General linear model (GLM) was used in which CARS 1 CARS 2 , ATEC 1 ATEC 5 , AHS 1 AHS 5, and SQ 1 SQ 2 are kept as dependent variables and independent variable (Improvement grades - worsening, Status Quo, Mild Improvement, Moderate improvement and Marked Improvement) are kept as fixed effects at 5% alpha level of significance. 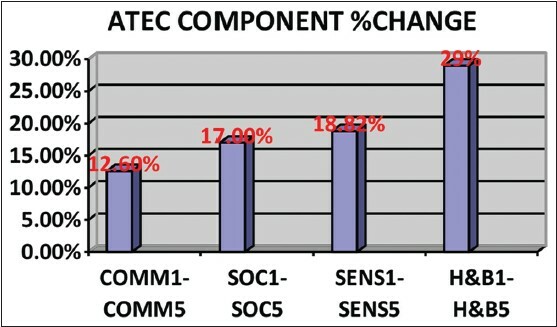 Change in ATEC scores six months prior to intervention i.e. ATECprev- ATEC 1 was tested and found statistically significant. 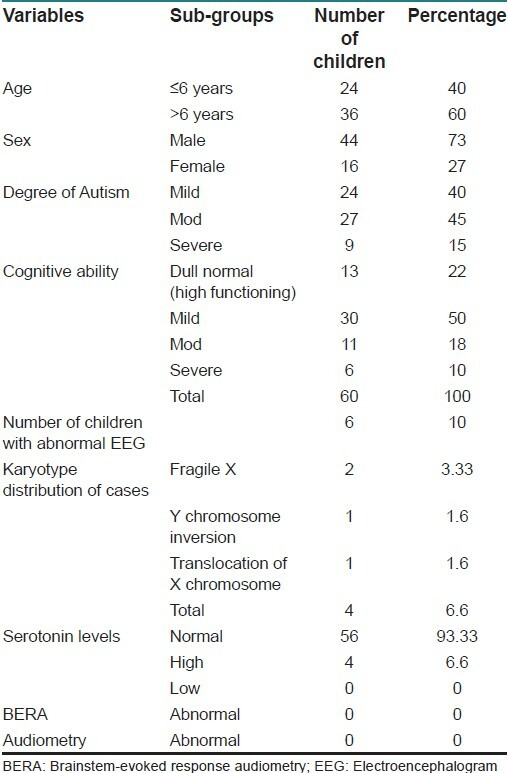 A summary of baseline distribution of children is provided in [Table 1]. The following observations were made out of the study data with respect to the following variables. A consort flow chart showing the number of participants at each stage of the study is provided in [Figure 1]. Autistic Savant is an autistic child who possesses brilliantly exceptional qualities. Such three cases with age 9, 9 and 8 years, respectively, presented with possessing qualities like brilliant flair of languages, ability to read and write nine languages. One child presented with a remarkable memory of recalling any passage from epic or novel, superlative skills for swimming, skating and calculations and unusual ability to read mother's mind. Another child had amazing ability to draw sketches just from his memory. Four children had elevated serum serotonin levels before treatment. All of the four showed decrease in levels after the homoeopathic treatment. There was corresponding clinical improvement in these cases. Four other cases had normal serum serotonin levels before treatment, which increased above normal after homoeopathic treatment. These cases also showed significant clinical improvement. In severe autism cases, out of nine cases, only one showed high serotonin level before treatment. The mean ATEC score obtained six months prior to the treatment (ATECprev) was 72.70. The children were observed for six months without any treatment. An ATEC was recorded at the time of commencement of treatment; pre-treatment (ATEC 1 ) and post-treatment (ATEC 5 ) were 79.45 and 64.33, respectively. When we examined the profile of cases in six months prior to homoeopathic treatment, where some children were receiving regular traditional therapies but none of them received homoeopathic medicines, we could see that there were a number of children who were not doing well. When we analyzed these data, the following pattern emerged. Ascending pattern of ATEC scores during the self-control period indicated deterioration of autism and post-intervention descending pattern of ATEC scores indicated improvement. ATEC 1 score of 79.45 suggest worsening of autism when compared to ATECprev score of 72.70 at six months prior to treatment (self-control period). After starting the homoeopathic treatment, there was reversal in the post-treatment ATEC 3 score to 70.42. 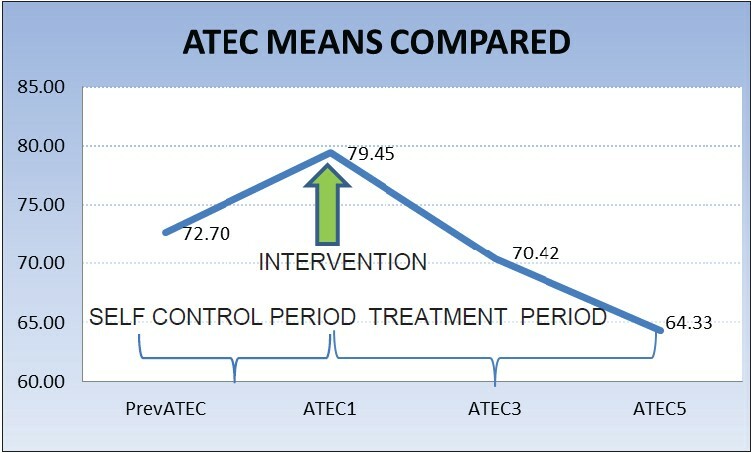 The difference of the mean ATEC scores six months prior to homoeopathic treatment and at the start of the homoeopathic treatment (ATECprev-ATEC 1 ) was - 6.75 (minus 6.75). The difference in pre-treatment and post-treatment mean ATEC scores (ATEC 1 - ATEC 3 ) were 9.03 i.e. mean percent change of 11.36. Thus, we can see that there is a significant change after the introduction of Homoeopathy. Subsequently, ATEC scores repeated every three months i.e. ATEC 4 (67.35) and ATEC 5 (64.33) showed reduction. Post-intervention, difference in ATEC scores i.e. 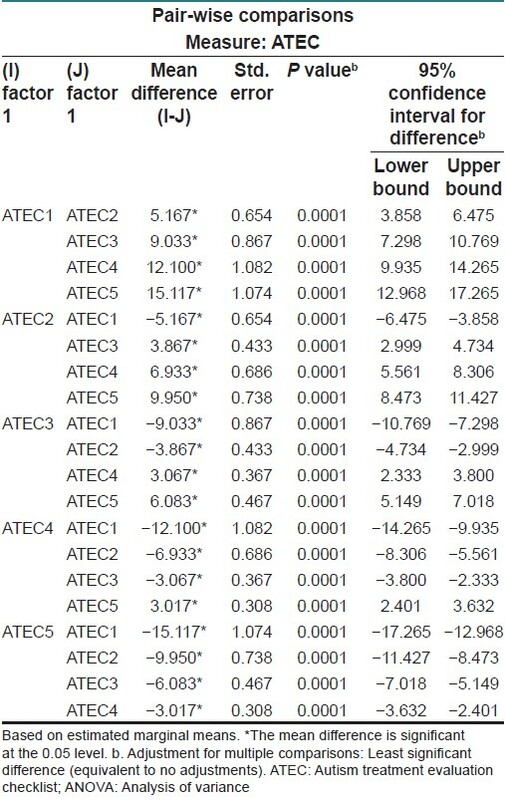 ATEC 1 -ATEC 5 was 15.12 [Figure 2]. This implies ATEC mean percent change was 19.03. Post-intervention highest change observed was 44% and there were 16 cases where ≥30% change was noted. At the end of the observation period of six months before homoeopathic treatment, out of 60 cases, 52 cases showed deterioration in ATEC scores, five cases showed status quo and three cases improved. A statistically significant difference (P = 0.0001) was observed in ATEC score at one year (ATEC 5 ) compared with baseline (ATEC 1 ), which also justifies clinically significant improvement in autistic features of the children. Also, a statistically significant difference was observed in all the ATEC scores (ATEC 2 , ATEC 3 , and ATEC 4 ) recorded at different quarters compared with baseline (ATEC 1 ) [Table 2] and [Table 3]. ATEC assesses change in impairment in specific aspects of autistic features like communication, socialization, sensory awareness, and health and behavior. A statistically significant difference was observed in all the autistic features recorded at different quarters compared with baseline, which also justifies clinical improvement in all the autistic features of the children [Table 4]. Maximum improvement observed is in behavioral component followed by sensory aspects [Figure 4]. ATEC scores were evaluated every three months. 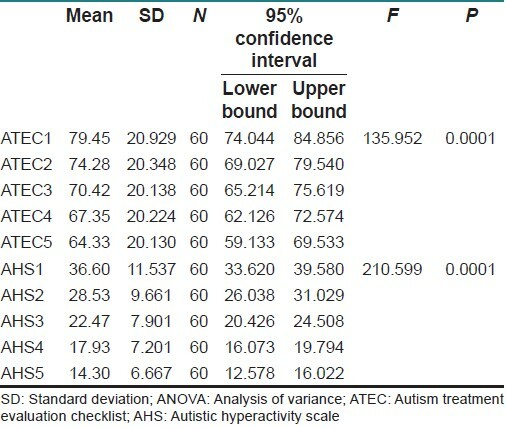 Hence, we could compare changes in autistic features at the end of each quarter and quantify in percentage form. There was a reduction in the ATEC score after starting the homoeopathic treatment i.e. 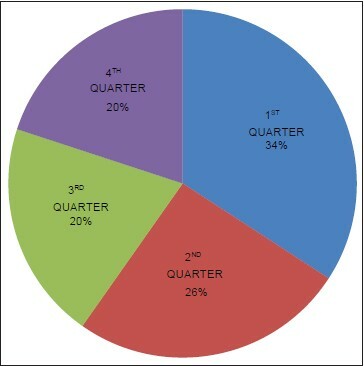 34% improvement in the first quarter [Figure 3]. AHS allows us to perceive degree of behavioral dysfunction. The mean pre-treatment score (AHS 1 36.6) and post-treatment score (AHS 5 14.3) showed statistically significant change of 22.30, which is 59.08% change (P = 0.0001), which clinically indicates improvement in behavioral dysfunction by reduction in hyperactivity, impulsivity, tantrums, self-injurious behavior, etc., Also, a statistically significant difference was observed in all the AHS scores (AHS 2 , AHS 3 , and AHS 4 ) recorded at different quarters compared with baseline (AHS 1 ) [Table 2]. A mean value of CARS score before treatment (CARS 1 ) was 33.93 while the mean CARS score after treatment (CARS 2 ) was 31.44. A paired t-test showed a T-value of 9.496 and P value of 0.0001, which indicates statistically significant difference at one year (CARS 2 ) compared with baseline (CARS 1 ) [Table 5]. Of 60 children, a total of 9 children, who had mild autism, had CARS score as <30 at post treatment which indicates becoming non-autistic after intervention (P value 0.0001), while 10 cases with moderate autism became mild [Table 9]. A statistically significant difference in the mean scores was observed in children belonging to all the categories based on degree of autism, i.e. mild, moderate, and severe (14.45, 16.81 and 11.78 respectively with P < 0.005) [Table 6]. A statistically significant difference in the mean scores was also observed in autistic children belonging to different categories of cognitive ability, i.e. dull normal, mild MR, moderate MR, and severe MR (17.46, 15.23, 14.64, and 10.33, respectively with P < 0.05) [Table 6]. A statistically significant difference was observed in SQ score at one year (SQ 2 ) compared with baseline (SQ 1 ) [Table 5]. It was observed that 43 children belonging to dull normal and mild MR category have shown significant change in cognitive ability; however, very less significant change in SQ was observed in children with moderate and severe retardation. Parents, teachers and therapist reported positive improvement in behavior and activities of daily living. High-functioning children reported improvement in scholastic performance. Autism research institute has provided ATEC range from mild to severe with percentile and corresponding ATEC scores. Based on changes in category, outcome measures in ATEC were defined. CARS gives range of mild, moderate and severe Autism, based on that % of improvement was taken up. At one year post-treatment, a mild (16), moderate (21), and marked (16) improvement was observed in majority of the children. However, a total of seven children were observed with either worsening or status quo scores [Table 7] and [Figure 5]. A multivariate analysis of variance performed on CARS, ATEC, AHS, and SQ scores showed significant results. 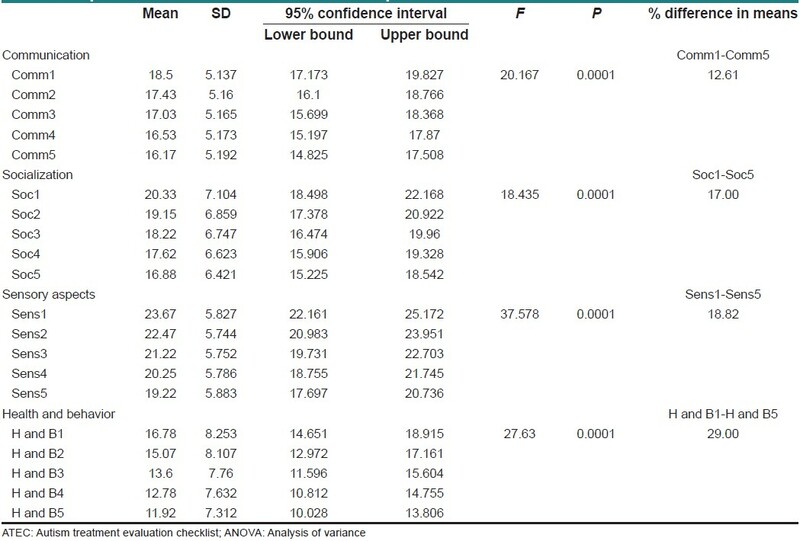 A statistically significant difference in almost all the scores at one year post-treatment compared with baseline indicates the significant change in all the dependent variables of improvement grade [Table 8]. A trend in improvement of degree of autism and different categories of cognitive ability was observed with regards to number of cases assessed pre-treatment and post-treatment. It was noted that a total of nine children became non-autistic after the treatment [Table 9]. First prescription means, first remedy which was prescribed at the time of commencement of treatment. In 22 cases, symptomatology changed, which demanded second prescription. Similarly four cases demanded further change leading to a third prescription. At a given time, only one indicated remedy was prescribed irrespective of the severity of the autism. From above [Table 10], Carcinosinum has come up in maximum number of cases (18 + 1 + 1) and it has also come maximum times as first prescription (18). Hyoscyamus came up in maximum cases as the second prescription. Centesimal scale potencies were utilized commencing with 200C potency. Symptomatology was reviewed periodically. When there was no further improvement, potency was raised to 1 M and later 10 M. Changes in symptomatology necessitated second prescription. A total of 23 cases demanded infrequent doses (where remedy is repeated at an interval of two or greater than two weeks), while 28 cases demanded moderately frequent repetition (where remedy is repeated one in a week or for three consecutive days of the week), while nine cases required very frequent repetition (where remedy is repeated once every day of more than once in a day) to the extent of being repeated even twice or thrice in a day. Eight cases presented with acute exacerbations of symptoms like intense agitation, restlessness, unmanageable aggression, oversensitivity especially to sound and sometimes marked self-injurious behavior and incontinence of urine and stool. Stramonium and Hyoscyamus came up to control these episodes and required to be repeated very frequently, even every four hours. Acuteness reduced in 4-5 days while the indicated medicine was required to be continued for two weeks. None of the cases required to be hospitalized or transferred to other experts. But of course it needed close supervision. The study demonstrated a significant reduction in autistic features (P = 0.0001). Homoeopathic intervention brought about modification in the behavior followed by significant changes in other aspects viz., sensory impairment, socialization and communication. Challenges in the treatment of autism have been phenomenal. Allopathic medications like Risperidone therapy addresses hyperactivity and aggressive behaviors and is more suited to conditions like ADHD as it does not help in addressing to the core features of autism viz. repetitive and stereotyped patterns of behavior, interests, and activities as well as social and communicative impairment of autism. Homoeopathic medicinal treatment of autism by Gupta et al. found 60% (n = 6) improvement in autistic symptoms by classical method of homeopathic treatment, whereas non-classical showed 38% (n = 3) improvement. This showed positive role of Homoeopathy in the management of autism. Patient compliance and small sample size were the limitations of this study. Current study was extensive enough to cover up children from both the sexes as well as evenly distributed in age groups. It covered up the entire range of autism; mild, moderate and severe, while from the standpoint of cognitive ability, children were from high functioning to mild, moderate, and severe mental retardation. Children who were gradually regressing and showing trend toward deterioration showed improvement in the autistic features. Across this range, changes achieved in the scores were statistically significant and intervention helped to bring down the autistic load. When we study the pattern of response in behavioral disturbances as well as core autistic features, following points emerge. A statistically significant difference (P = 0.0001) was observed in ATEC score at one year (ATEC 5 ) compared with baseline (ATEC 1 ), also a statistically significant difference was observed in all the ATEC scores (ATEC 2 , ATEC 3 , and ATEC 4 ) recorded at different quarters compared with baseline (ATEC 1 ), which justifies the clinically significant improvement in autistic features of the children reflected not only in behavior like hyperactivity and impulsivity, but also in all the core autistic features, such as sensory impairment, socialization, communication etc. This is further validated by statistically significant difference (P = 0.0001) in ATEC components mean, viz. communication, socialization, cognitive and sensory awareness, and health and behavior. Analysis of the components also indicates that Homoeopathy brought about improvement in the area of behavior and sensory impairment quite early during the course of treatment. These changes facilitated psychosocial adaptation of autistic children. Rate of change as well as quantum of change in the autistic features is not directly proportional to degree of autism but partially dependent on it. There is a statistically significant difference (P ≤0.005) in the mean scores of all the types of autism, i.e. mild, moderate, and severe. This implies that Homoeopathy can bring about significant improvement in all the types of cases of autism. However, mild and moderate autism indicate superior change in comparison to severe autism. Treatment had impact on all the categories of autistic children classified from the standpoint of cognitive ability (P = 0.0001). However, children with dull normal intelligence showed the highest improvement followed by children with mild retardation. This implies that cognitive ability is an imoportant variable, which has an impact on the outcome of treatment. Overall mean SQ has shown improvement post treatment. Study demonstrated significant change in SQ in children with dull normal and mild retardation while those with moderate and severe retardation have not shown significant change in SQ, while their autistic features have improved. Children who were diagnosed to have mental retardation demonstrate significant adaptive living skills deficits. Measured intellect deficit could be reflection of current behavioral, communicative, and social difficulties in autistic children. Overall improvement in core autistic features can bring about significant change in child's adaptive skills. To that extent, we can see improvement occurring in retardation as reflected in SQ as well as in special educator's observation about child's improved ability. By effectively reducing core autistic features consistently over a one-year period, the study demonstrated a good improvement in these children's psychosocial adaptation, activities of daily living, and even scholastic performance. Carcinosinum came up in maximum number of instances as first prescription (n = 18), which was followed by Stramonium. What is significant is to observe second prescription coming up in the management. Changes in the set of characteristic indications demanded the second prescription. We observed this phenomenon in 22 instances. Thus, out of 60 cases, in 22 cases, 2 remedies were required in sequence, for e.g. Opium followed by Causticum, Stramonium followed by Hyoscyamus. While in four cases, three remedies were required in sequence. For e.g. Nux Vomica - Stramonium - Carcinosin and Medorrhinum-Lycopodium-Lachesis, while in 34 cases, only one remedy was required. The study allowed us to obtain the profile of characteristic symptoms of prescribed medicines and has also given us a number of clinical indications. These aspects have not been discussed here. Autism is a serious chronic disorder hence homoeopathic treatment will demand careful observation and analysis of the changes in symptomatology, which will be reflected in identification of second prescription. The number of children suffering from mild, moderate, and severe autism is not uniform, nor large enough to study comprehensively differential impact on different types of autism. Multi-centric, double-blind, placebo-controlled, randomized study will be further helpful. Change in cognitive ability with regards to mental retardation is a complex phenomenon and would take into account number of variables. To analyze all these is beyond the scope of the current study. The study has demonstrated the usefulness of homoeopathic treatment in the management of neuropsychological dysfunction in childhood autism disorder, which is reflected in the significant reduction of hyperactivity, behavioral dysfunction, sensory impairment as well as communication difficulty. This was demonstrated well in psychosocial adaptation of autistic children. Autism is a serious developmental disorder and demands administration of homoeopathic medicines through holistic perspective. However, more extensive multicenter double-blind study with diverse population will be extremely helpful. 1. Michael BF, Harold AP, Allen F, Ruth R, Nancy E, Wendy w et al. Pervasive developmental disorders, DSM IV-Diagnostic and Statistical manual of mental disorders. American Psychiatric Association, 4 th ed. 2000. New Delhi: Jaypee brothers medical publishers; 2005. p. 59-61. 2. Davidovitch M1, Glick L, Holtzman G, Tirosh E, Safir MP. Developmental regression in autism: Maternal perception. J Autism Dev Disord 2000;30:113-9. Open Available from: http://link.springer.com/article/10.1023/A: 1005403421141. [Last accessed on 2012 July 02]. 3. Russell G. The Rise and Rise of the Autism Diagnosis, Autism-Open Access, Available from: http://www.omicsgroup.org/journals/2165-7890/2165-7890-2-e104.pdf. [Last accessed on 2012 July 02]. 4. Action for autism, national centre for Autism. Available from: http://www.autism-india.org/afa_autisminindia.html. [Last accessed on 2012 July 02]. 5. Geórgia F, Fábio B, Fabiane D Krishna M, Monica D, Maria F, et al. Effect of homeopathic medication on the cognitive and motor performance of autistic children (Pilot study). Int J High Dilution Res 2008;7:63-71. 6. Launay JM, Ferrari P, Haimart M, Bursztejn C, Tabuteau F, Braconnier A, et al. Serotonin metabolism and other biochemical parameters in infantile autism. A controlled study of 22 autistic children. Neuropsychobiology 1988;20:1-11. Open Access available on http://www.ncbi.nlm.nih.gov/pubmed/2466221. [Last accessed on 2008 Jul 03]. 7. Rimland B, Edelson SM. ATEC- Autism Treatment Evaluation Checklist, Autism Research Institute, San Diego, U.S.A, Available from: http://www.autism.com/index.php/ind_atec [Last accessed on 2008 Jul 03]. 8. Schopler E, Reichler R, Renner BR. CARS- Childhood Autism Rating Scale. published by western psychological services, U.S.A., Tenth printing, 2004. p. 3-14. 9. McDougle CJ, Scahill L, Aman MG, McCracken JT, Tierney E, Davies M, et al. Risperidone for the core symptom domains of autism: Results from the study by the autism network of the research units on pediatric psychopharmacology. Am J Psychiatry 2005;162:1142-8. Open Access, Available from: http://journals.psychiatryonline.org/article.aspx?articleid=177599. [Last accessed on 2008 July 04]. 10. Gupta N, Saxena R, Malhotra A, Ritu J. Homoeopathic medicinal treatment of Autism. Indian J Res Homoeopathy 2010;4:19-28. 11. Small Terry, Interview with Dr. Daniel A. Rossignol- Hyperbaric oxygen therapy improves symptoms in autistic children. Pearblossom Inc; 2006. 12. Bobby N. What is the relationship between autism and mental retardation? Available from: http://www.asatonline.org/resources/clinician/mental. [Last accessed on 2012 Jul 02].